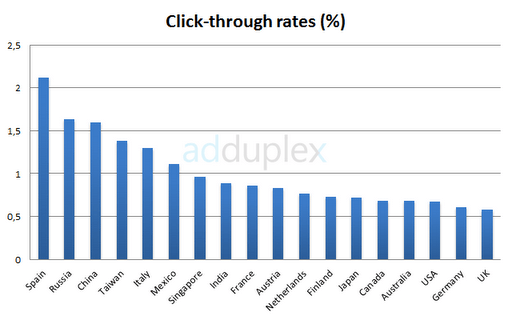 Here’s a chart of one week of click-through rates on AdDuplex grouped by user’s country. I’ve only selected the countries with at least 50,000 impressions over the week. The results are quite unexpected. Spain leads the way with 2.1% CTR. Interestingly USA is only 16th (with 0.7%), followed by Germany and UK. The chart would suggest that 1st wave countries got to some point of “ad fatigue”, but Spain and Italy contradict this assumption. What do you make out of this data?